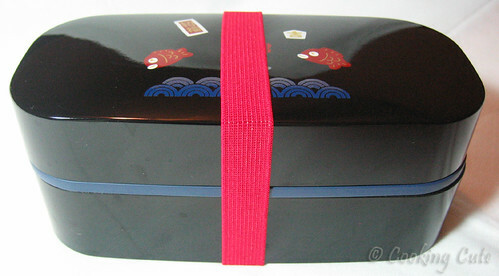 A bento box is designed to hold lunch for one, with individual compartments and sometimes multiple tiers for rice or noodles and several side dishes. Some boxes are microwave-safe, but most of the fancier ones are not. 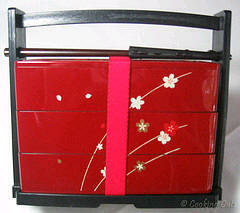 They are made of materials ranging from traditional wood to aluminum to plastic (don't microwave metal!). 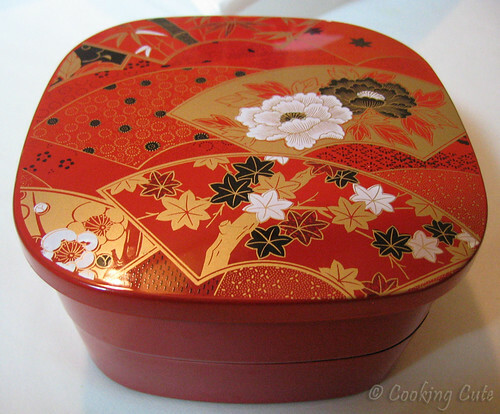 Japanese bento boxes are available at Asian markets and online from various sources (see Links and Resources section for suggestions). You also can pack bento in normal tupperware (or sectioned tupperware if you can find it) or even American-style lunchboxes. 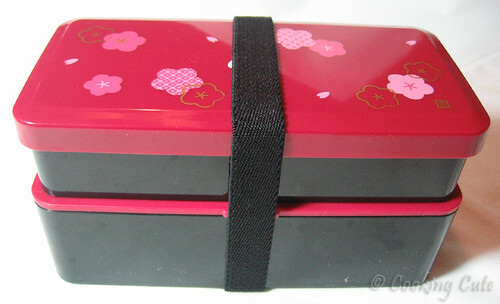 This is my usagi bento set - one of the most flexible bento boxes in my collection. 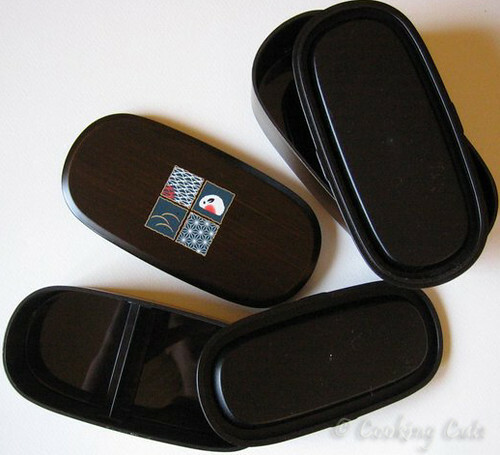 It is nicely sized (6"x3"x3"), the rectangular shape is easy to work with, and the black-colored tiers make food look delectable. 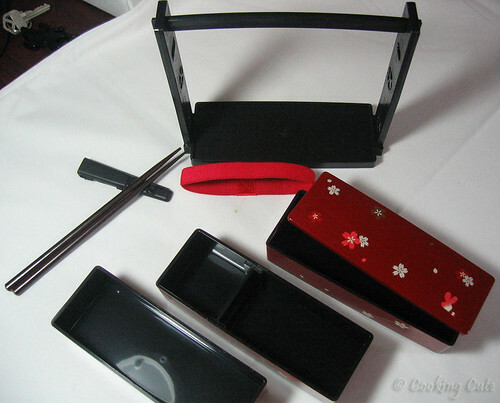 The box comes with a rice mold, elastic band, removable dividers for both tiers, and matching kinchaku, chopsticks, and chopsticks holder. It really is too adorable! 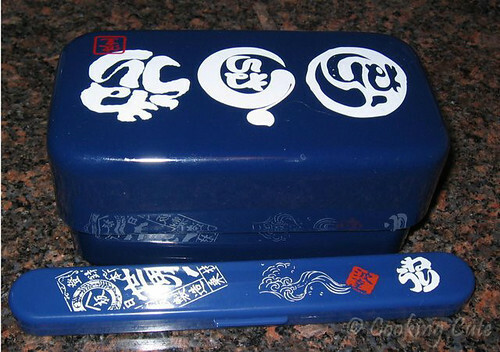 This is one of my more unique bento boxes. 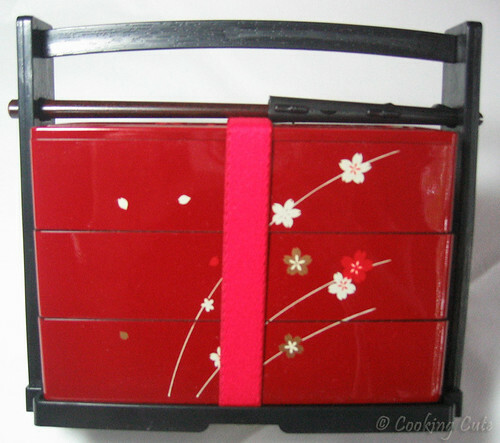 It is a 3-tier box made by Hakoya (which makes really high quality bento stuff) that is held in its carrier by a pair of chopsticks. Each tier is relatively small (measuring 6"x2"x4" together ), but in total, the tiers hold quite a bit of food. 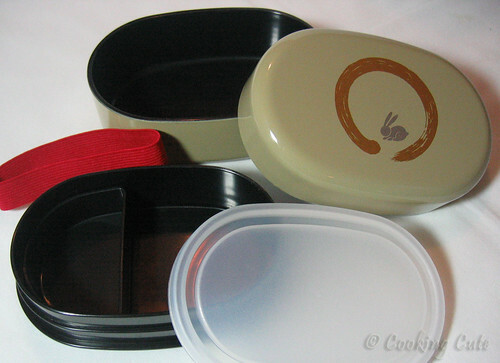 The bento is not microwaveable and does not have watertight seals – each tier just rests on top of the other. As a result, I pack relatively dry foods only. This is another Hakoya bento box that the hubs bought for me in Japantown in San Francisco while he was on a business trip (with regard to my bento addiction, he is a total enabler). The set is very weighty and feels nice in the hand. 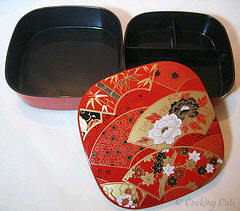 The bento box also is a little roomier than typical ones designed for women (7"x3"x3"). Somehow the white lid was lost – so sad! 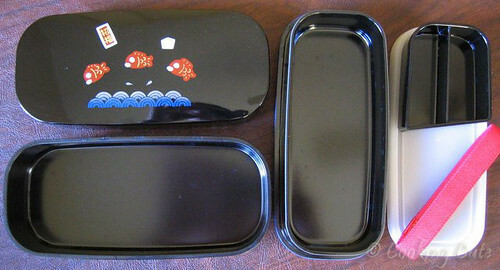 How can you not love this bento box? It is Totoro and has gilt detailing! 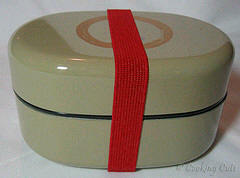 The box, which measures 4.5"x4.5"x3", has two very roomy tiers that fit oodles of food. 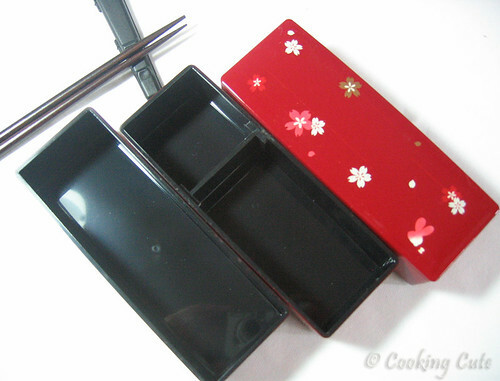 This bento also doesn't have watertight seals. 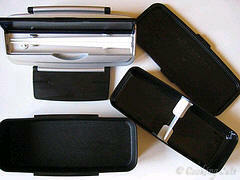 Nor does it have an elastic band to hold it together due to its width. 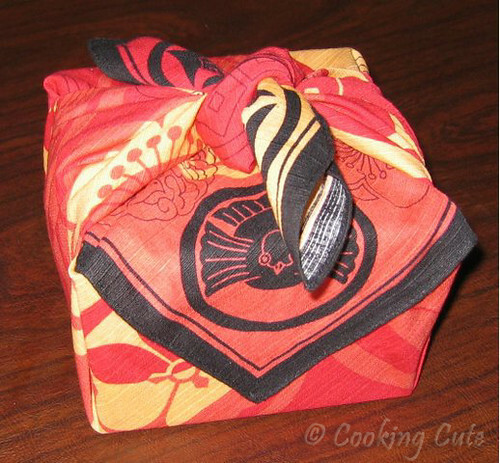 To keep the bento box together, I use a furoshiki, which is like a giant handkerchief that you use to wrap your bento up in. You can slip a pair of chopsticks under the knot to complete the package. 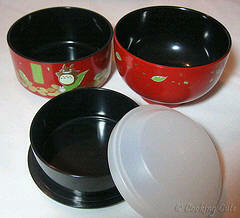 I am of the mind that everyone should have a bento bowl set. These little things are so handy! 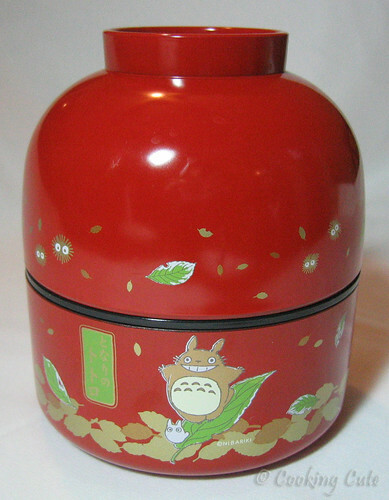 I like mine because the 2nd tier has a white domed lid that makes use of the space under the red bowl lid. 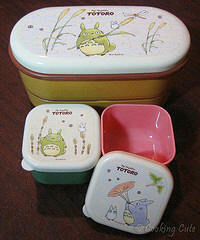 I also like this set because it coordinates nicely with my square Totoro bento box. Hee hee. I use this bento box for normal lunches and soup-based lunches. It doesn't have a band to hold it together, so I use one of those little black bags that you get free with your order from Sephora. A perfect fit! 4" in diameter, 5" high. This is one of the cutest bento sets I own. Plastic, but with a wood-like appearance, the bento comes with a removable divider and separate lids for both tiers. The tiers collapse for storage as well. I bought this bento box from a little Japanese store in Houston, TX. 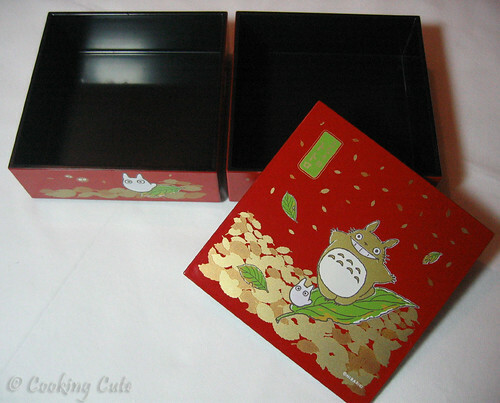 The box adorably small, has a removable tray, and a lid for the upper tier. 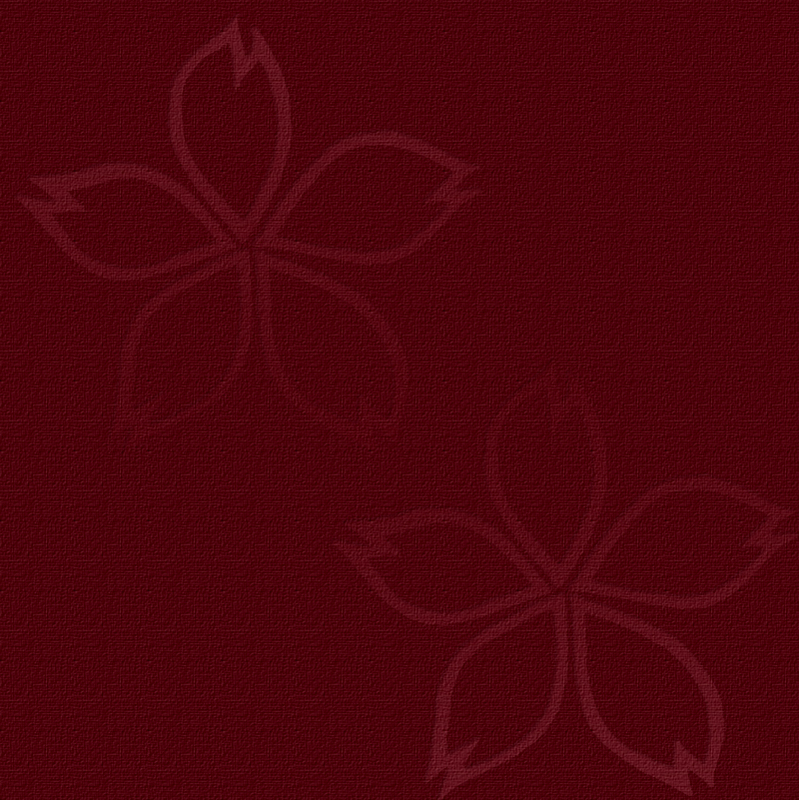 The dimensions are 5"x3"x3". I use this box much more often than I thought I would given its small size. 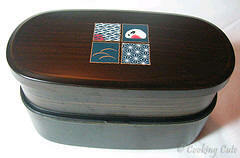 This beautiful bento box was a 30th birthday gift from my dear friend, Cat. 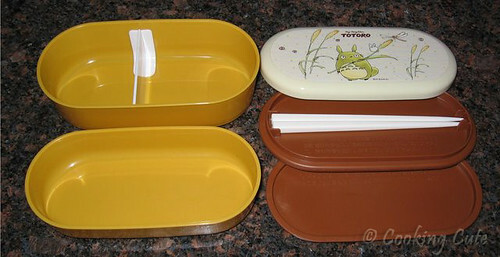 It is by far one of the most roomy bento boxes I have (5.5"x5.5"x3"). Sometimes I use only one tier. 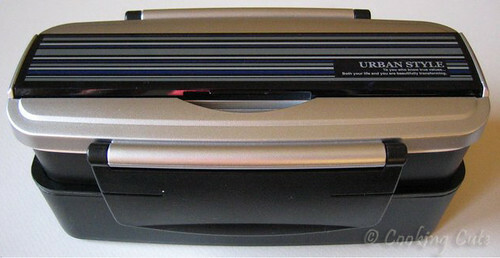 The dividers in the bottom tier are permanent, and the bottom tier fits inside the upper one for storage. 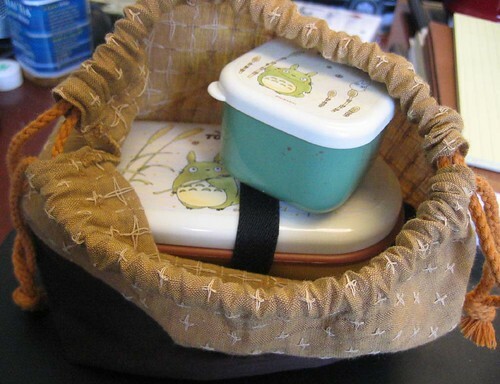 I use a furoshiki to hold this bento box together. The Urban Style bento is designed specifically for men. It has two large tiers measuring 8"x3"x3" together, a built-in chopsticks holder, a lid for the bottom tier, and a removable divider. 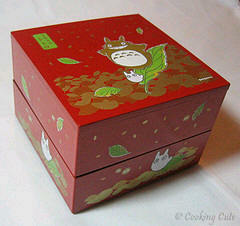 I am able to fit tons of food into this box for my hubs. It is microwaveable as well. This used to be my husband's bento box, but was way too small to accomodate his appetite (5.5"x3"x2.5"). 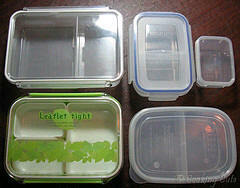 My microwaveable bento box collection – I have various sizes to accommodate the different foods that I like to pack. 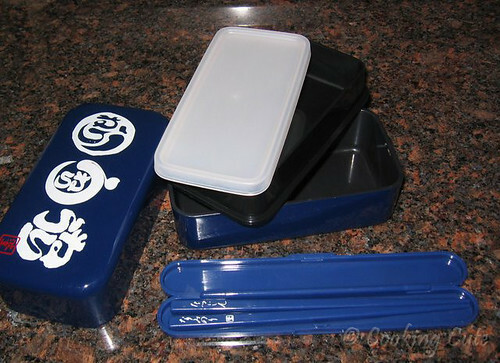 These containers also pinch hit as regular bento boxes for my hubs when he forgets to bring his set home from the office. 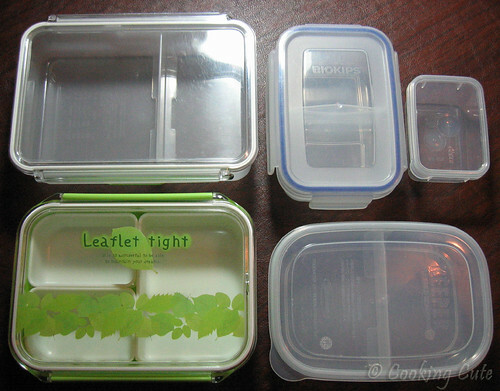 Top left container is 7.5"x5"x2" (purchased from The Container Store); the top middle is a Lock'nLock container with removable cups that is 5.5"x3.5"x2" (purchased from H Mart); top right is a snack container that comes in a pack of 4 (purchased from The Container Store); bottom right box is 6"x4.5"x1.5" and has a removable divider (purchased from The Container Store); and the bottom left box is a Leaflet Tight single-tier bento with 3 removable sections that measures 6"x4"x1.5" (purchased from H Mart). 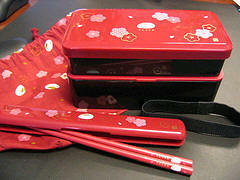 The Leaflet Tight bento has a matching green kinchaku. 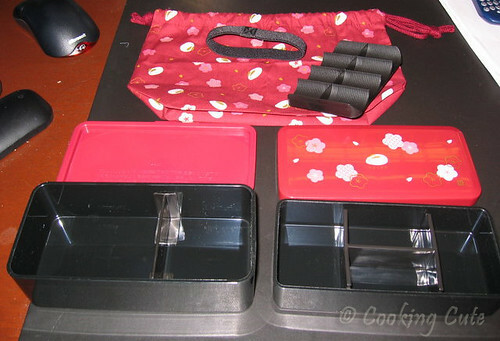 To the left are my kinchaku that I use to tote my bento sets around in. 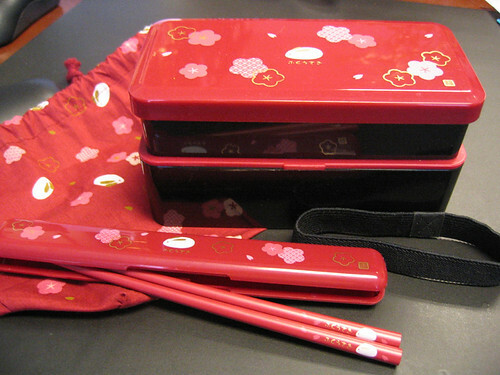 The green one came with my Leaflet Tight bento, the red one came with my usagi bento set, and I bought the other two from The Bento Store. 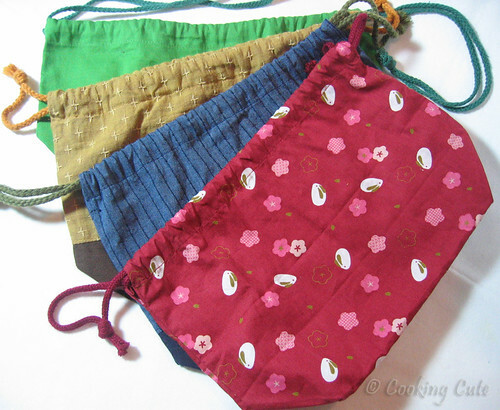 To the right are my two furoshiki that I use to tie up my square bento boxes (although they would work fine with a box of any shape). 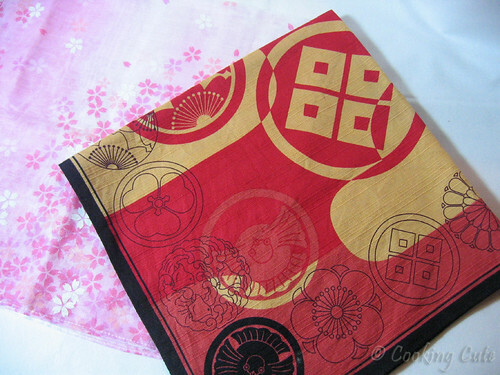 I bought both from Nagomi, Inc. As is traditional, I tuck in a pair of chopsticks under the knot tied at the top. 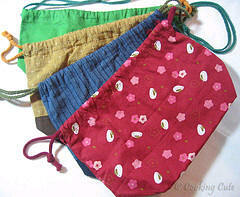 Handkerchiefs or bandannas also would work well.